This past weekend the Community Relations team was privileged to participate in the 2016 Winnipeg Santa Clause Parade. 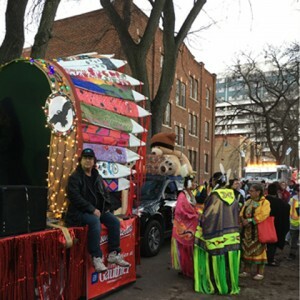 We teamed up with the Southern Chiefs Organization and created the FIRST Indigenous float in a Winnipeg Parade and received national attention. It was a beautiful evening; +13 C to be exact!? We were all way over dressed! The crowd gathered by the thousands. What a source of pride it was to see a giant headdress mounted on the float; each feather painted by communities in Southern Manitoba.? Beautiful Christmas carols, sung by Rhonda Head in Cree resounded around us and the drum group South Wind Singers carried traditional songs to the dancers dressed in regalia around us.? Walking in front of us was the Winnipeg Bear Clan, our protectors, leading us along the parade route. And finally, the APTN team, dressed in red carried bags of candy behind the float to hand out to the children in the crowd. What a reception we received!? Along the parade route our float would stop for short periods so our dancers could share their culture and heart with those in the crowd.? The Drumming echoed off the buildings along Portage Avenue and the dancers in all their beautiful colours blew the crowds away!? The cheering and applause left me with a very full heart.? Our team realized at the end of the parade route that we had not stopped smiling. We would all do it again in a heartbeat! This left me pondering how getting involved in community not only affects the community as a whole, but if affects you too!? See, I believe the Creator gave us life to take care of each other.? Being engaged in “Community” creates a sense of belonging and accomplishment; the satisfaction you receive from seeing joy in others is the best of all. What is holding you back from being involved in Community? Don’t wait on the sidelines for the “right” volunteer opportunity to come along. There is always fear in doing something new…push through it or take a friend with you for support. Give in other ways…..prayers, clothes, food, money! By the way, new research published in Psychological Science by the University of Pennsylvania, Harvard and Yale say that when people give of their time, it actually makes them feel like they have more time in their day! This same research found that giving time creates a stronger willingness to commit to future engagement. Basically, the fullness you experience will make you more likely to do it again! Volunteer with your kids. Take them with you!? Children learn by example.? If you want your children to be givers, let them see you give. Giving to others with your children is one of the best ways to build strong morals in them. It teaches them compassion, tolerance, empathy, and gratitude. Sew, knit, pray! You may not be young enough to help build a community centre, but you can help make cookies for the workers! Getting out and doing something different might put a spring back in your step. Remember, you are now in a perfect position to be a positive role model to children and other adults. I hope these thoughts will encourage you to get more involved and seek out ways to change lives.? As the old saying goes, I may not be able to change the whole world, but I can change the whole world for someone.